Just Simply Photography: Christmas: Day 16 and Counting - Mary Did you Know? Christmas: Day 16 and Counting - Mary Did you Know? And it did give me an extra day to think and listen to more Christmas music. This song, Mary Did you Know, was written by Mary Lowry in 1984 and Buddy Greene. So many people have performed, recorded or sung this song since then. My absolute favorite was CeeLo Green. Not the most likely person in my mind to even sing it, but the notes just flowed from his voice. But that's not the video linked below. This link is to a version of the song sung by Mark Lowry, with an intro to the song at the beginning. This was his very first time recording it. He wrote the lyrics and Buddy wrote the music. Together they blended so perfectly into this beautiful song, with so much passion about the baby born of Mary, who was the creator of the universe, and now was laying in her arms. This song is no less than a really great question. Wouldn't you like to ask Mary if she knew what was going on the whole time? She was only 13 or 14 years old, I'm guessing she had no clue. Other than what the angels told her. Read how it's described in Luke 1:26 - "In the sixth month of Elizabeth’s pregnancy, God sent the angel Gabriel to the Galilean village of Nazareth to a virgin engaged to be married to a man descended from David. His name was Joseph, and the virgin’s name, Mary. Upon entering, Gabriel greeted her: Good morning! You’re beautiful with God’s beauty, Beautiful inside and out! God be with you." The very next verse, "She was thoroughly shaken, wondering what was behind a greeting like that." Who wouldn't be just a little freaked out at a glowing being walking into your room and telling you were a hottie? I mean, really? Some stranger walks in and starts talking crazy talk. At this point, Mary wasn't yet pregnant. Gabriel was telling her what was going to happen. Do you think in that moment she was thinking this was a good idea, bad idea, a crazy idea? Or was she was turning a peculiar shade of pale and thinking no, oh, no you don't! Her life must have flashed before her in those seconds, at least the life she thought she was going to have before all this. This changed everything. Her reaction, not so typical for a teenager, continuing on in verse 36: "And did you know that your cousin Elizabeth conceived a son, old as she is? Everyone called her barren, and here she is six months pregnant! Nothing, you see, is impossible with God. And Mary said,Yes, I see it all now: I’m the Lord’s maid, ready to serve. Let it be with me just as you say. Then the angel left her." He left. He didn't have to convince her. He didn't have to persuade her. He didn't have to prove anything. To her, it was clear, God called her for a very specific role in this place, at this time. It took another miracle to help her see and believe, but believe she did. The next verses describes how she wasted no time and ran straight to Elizabeth's house to share her news and see her miracle. It tells of Elizabeth's baby deciding at that very moment when Mary walks in to do jumping jacks in her stomach. Up until this time, the baby had not moved. This made Elizabeth absolutely crazy with joy. She started dancing and singing. And she knew Mary was pregnant, calling her the Mother of her Lord. She affirmed Mary's decision to believe, "Blessed woman, who believed what God said, believed every word would come true!" This must have been so reassuring for Mary, realizing that someone else knew what was going on and she would have her to lean on and share this amazing experience. "I’m bursting with God-news; I’m dancing the song of my Savior God. Not only did Mary get it, she totally got it. She remembered the teaching about the promises God made to His people that a Savior would be born. Anybody and everybody who has watched Charlie Brown Christmas knows this verse that little Linus recited, Isaiah 9:6, "For unto us a child is born, unto us a son is given: and the government shall be upon his shoulder: and his name shall be called Wonderful, Counselor, The mighty God, The everlasting Father, The Prince of Peace. Of the increase of his government and peace there shall be no end, upon the throne of David, and upon his kingdom, to order it, and to establish it with judgment and with justice from henceforth even for ever." The notion of her baby being the Son of God was starting to ring true because of the prophecy she had heard probably most of her life. She knew the same prophecies that we can read in the bible, but for her, it had been passed down through the generations of her family. The other interesting thing about this story, back in verse 26, she was engaged to Joseph, a man who was a descendant of David. Really he was in the blood line of a King. And Jesus' lineage was also of David. Between David and Jesus was Solomon, David's son. Whose mother was Bathsheba. Don't know if you remember or not, but Bathsheba wasn't David's wife. She was the beautiful woman who was bathing on the rooftop that David lusted after, sent her husband into battle to be killed for and ended up sleeping with her and having a son, Solomon. This is the line that God allowed Jesus to be descended from. God, in his infinite wisdom, can make anything work together for good, if it pleases Him. He always has a bigger plan. Back to Mary, I also love what she says about God, " God took one good look at me, and look what happened—I’m the most fortunate woman on earth! What God has done for me will never be forgotten, the God whose very name is holy, set apart from all others." This feeling, like you just won the lottery, is one that only God can give. It's not something you can plan for, earn or order up from a menu. This is something that takes you completely by surprise and you know in your heart of hearts that it has to be from God. Only God. Every good and loving gift is from God. Mary knew this. She knew that God's favor was on her, and she gave Him all the credit. And she would forever remember that God did this for her, called her to be special and precious, and blessed with this child. I'm not really sure that she knew the full extent of what would transpire over the next 33 years. Especially the last 3, or even the last 6 months. She must have seen the determination in her sons eyes. Mary would have been no less than a mom and wanted to protect her son, her only son. She saw how Jesus grew into this person who reflected God's love, became completely enamored with him, respected him and trusted him. She could never have imagined how it would all end. Watching. Emotionally wrecked. Helpless. Trying to have faith still. Remembering how it all started with Gabriel telling her she was beautiful, full of God's beauty, both inside and out. It must have felt like a quantum leap to be in that final moment of Jesus' life, he was only a baby, just a minute ago, wasn't he? Can't we stop time? I don't think Mary would have survived if she knew what was planned for his life. She just woke up everyday, doing what she had to do, as his mother. Never thinking the end would come sooner than anyone would ever think. Mary was blessed, no doubt about it. She knew Jesus in a way no one else would. His smile, his laugh, his silliness as a kid, how he slept, how he cried, what his favorite meals were, what games he liked to play, the names of his friends, how he worked hard. I love how Mark Lowry described Jesus as a baby, his hands and fingers wrapped around hers were the ones that scooped out the oceans and formed the rivers; his feet were the same ones that had walked on stars and was worshiped by angels; his little lips were the same ones that spoke the world into existence. And she was his mother. No wonder people hold her in high esteem. We would trade places with her in a heartbeat. No challenge this time for your or me. 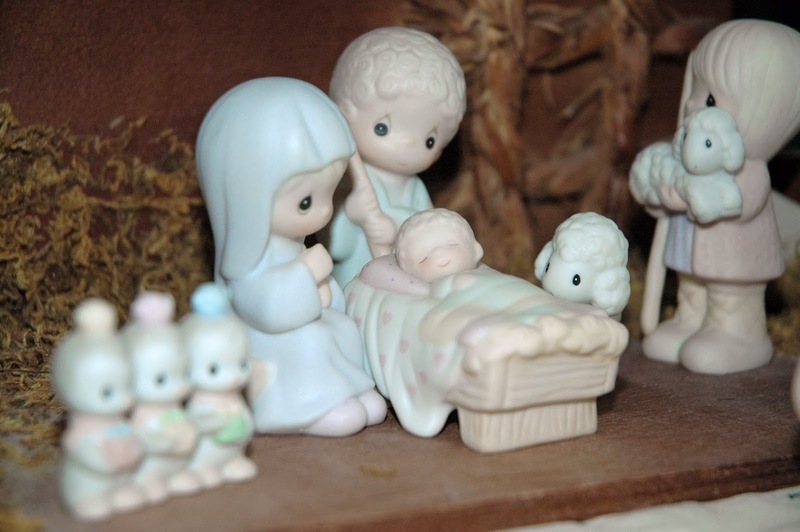 Just relish the thought that the little baby figure that you see laying in a manger scene, whether it's on the mantel, out on a lawn, or in a church, had a real purpose for being born. Believe it or not, that purpose was you.